If you’re a grilling enthusiast who can’t quite seem to master the finer points of the barbecue, or if you’re just learning to grill, this Bible of Barbecue has everything you need to get ready for summer cooking. 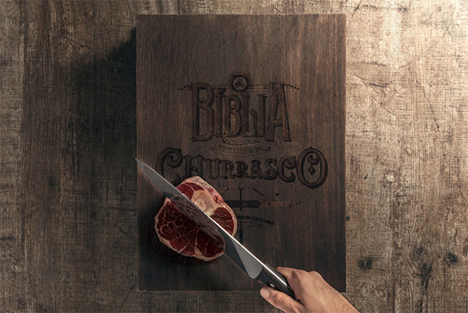 Cookware company Tramonitina and ad agency JWT Brazil released the very unusual book to help enlighten would-be barbecue experts. The book comes equipped with coal, a fire-starting page, a small fan to build the flames, a cutting board, salt for the meat, knife sharpener, apron, tray, and kitchen cloth. They are arranged like pages in a book that you remove one at a time in the order they will be used. The book can only be used with all of its functional contents once, but the case and some of the contents can be kept forever. 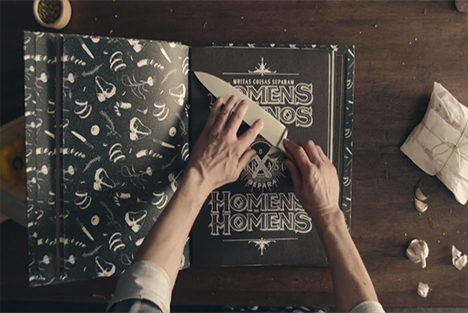 Judging from the promotional video, it looks like there may be instructional pages as well which stay in the book to provide guidance even after the charcoal has been smashed and the salt has been crumbled. Copies of the book were first sent to top chefs in Brazil but the company plans to sell it to the public in bookstores sometime in 2014.